The children and staff at Jeavons Wood had a wonderful day learning all about the Victorians on Wednesday 21st June 2017. We started off with a whole school assembly, where we could admire everyone's costumes and meet our important visitors, a Victorian laundress, Sergeant French from the Crimean War, and Queen Victoria herself! We also had experts to teach us copperplate handwriting with ink and embroidery skills. After assembly the children collected their Victorian stamp albums from the teachers and went to investigate all the different activities. Once they had completed some they could collect a Penny Black Stamp for their album. 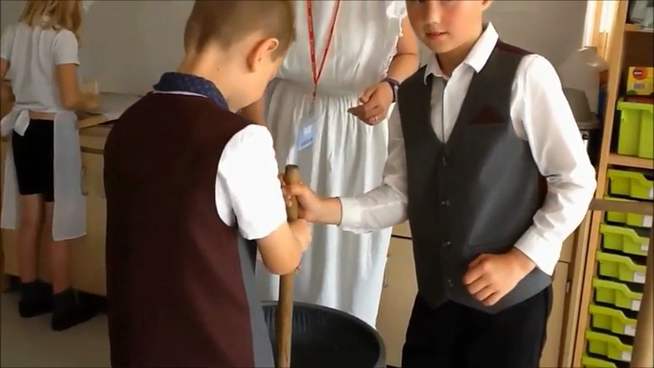 We all got to work sweeping an actual (model) chimney that we could even stand up in, making matches, shovelling coal and learning how to wash, mangle and iron Victorian style! In the servants zone, there was so much silver to be polished, windows to scrub and shoes to clean, and the table to lay for the master and mistress for luncheon that it kept everyone busy! Lots of children learnt about Brunel and his wonderful inventions, and made models of the first locomotives and steam ships, and even thaumatropes with moving pictures! We found that making silhouettes, copperplate writing and writing on slates is quite a skill, and after experiencing the Victorian classroom complete with a very strict teacher, chanting and a dunce hat most pupils were glad of their modern school! In the workhouse room there was "oakum picking" to be done and bread, cheese and gruel to weigh out for the paupers. Many children tried out their Victorian manners and conversational skills at the tea party table, and some beautiful embroidery was created, along with postcards showing the language of flowers and maps to show the four corners of the British Empire. For many a highlight was taking part in a re-enactment of the Charge of the Light Brigade with Sergeant French and trying a Crimean War army drill, complete with hobby horses! After so much to see and do everyone was ready for the parade in front of Queen Victoria, a "V for Victoria" biscuit and the National Anthem. All the special visitors commented on the curiosity and creativity of the children and were impressed with their concentration and polite manners. Queen Victoria was very amused too!